Abby Neu | Greer, Burns & Crain, Ltd.
Abby Neu is an attorney at Greer, Burns & Crain Ltd. in Chicago, concentrating on trademark and anti-counterfeiting litigation. Ms. Neu received her J.D. from the University of Iowa College of Law in 2015. During law school, she competed in the 42nd Annual Giles Sutherland Rich Patent Moot Court competition, where her team advanced from Regional to National competition, arguing current patent law issues in front of the U.S. Court of Appeals for the Federal Circuit. 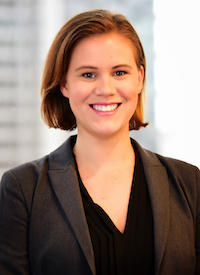 Abby also contributed to the Iowa Medical Innovation Group, advising and providing intellectual property consultation to medical and engineering students in designing a medical device. Prior to attending law school, Abby earned a B.S. in Chemical Engineering from the University of Iowa, with a minor in Spanish. During her time at Iowa Abby was a research assistant in a nanotechnology laboratory at the University of Iowa College of Engineering. In this role, she prepared and tested nano-polymers in various crystal structures to yield improved properties of polymer plastics.